The following post will demonstrate how to use Qlikview Visual Cues in a Straight Table chart, to highlight the maximum and minimum values for each expression over a given dimension. 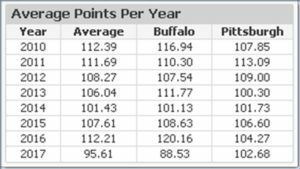 In this example, I will setup the chart to calculate Average Point totals per year, for two teams. 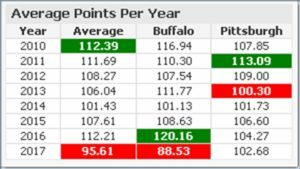 I use Set Analysis to isolate each team in a separate column, then use Visual Cues to set the background color of the maximum and minimum averages per team (green is maximum, red is minimum). This post covers several advanced functionalities, but the main purpose is to demonstrate how to use Visual Cues for a specific purpose. Next, once the data is loaded, add a Straight Table object to your Qlikview application. Caution: When you copy and paste the expressions below, you may need to reformat the apostrophe! !